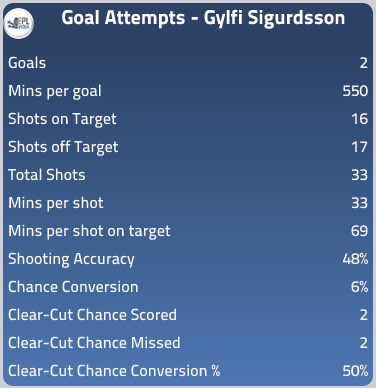 Has Sigurðsson Been As Good For Tottenham As He Was For Swansea? After an impressive loan spell with Swansea in the 2011/12 season saw him reach a tally of 7 goals and 4 assists in 18 Premier League appearances, Gylfi Sigurdsson made his way to White Hart Lane from Hoffenheim for £8.8M the following summer. Since joining us, Sigurdsson has made 20 starts in all competitions, scoring and assisting 6 goals. Despite making 20 appearances this season it has only really been in the last two months that we have seen him become a regular starter in the league for Spurs, having only played the full 90 minutes of one Premier League game before March. Those early season appearances left many fans feeling underwhelmed with his signing and it seemed that Sigurdsson was unable to replicate the excellent form he had last shown for Swansea. However, Sigurdsson has now started 5 consecutive Premier League games, and although this has been as a result in part to injuries to both Lennon and Bale, his performances have been warranted his place in the starting eleven. 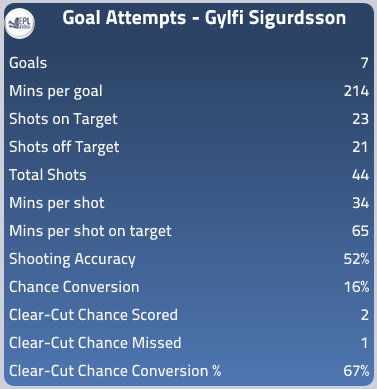 So, has Sigurdsson been as good for Spurs as he was for Swansea? Simply put, no; but a statistical analysis can demonstrate this more clearly. Last season he attempted a pass every 2.2 minutes with a 75% accuracy; this season he has attempted one every 2.8 minutes with a fall in accuracy to just 70%. Although arguably a minor change, it does demonstrate that he it yet to reach the performance level that we saw at Swansea. Another area of Sigurdsson’s play that has declined this season is his chance creation, in his 18 Premier League appearances during the 2011/12 season he created a chance every 30 minutes, this has fallen to one every 46 minutes this season. His dribbling is another area of his play that has statistically suffered when compared to last season’s figures. Sigurdsson has made just 6 successful dribbles this season; equating to once every 122 minutes, compared to every 88 minutes last term. The visible decrease in performance statistics could be attributed to Sigurdsson’s change in position this season; he took up a more central attacking role just behind the striker during his time at Swansea, whereas he has been used in a wider, more defensively dynamic position under Andre Villas-Boas. However, it is most likely to be down to the fact that Sigurdsson has only just recently secured his place in the first team, which is made increasingly evident by the fact that his performances in his past 5 Premier League matches have been of a consistently higher standard than what has come before. The comparisons made from his performances last season clearly show that Sigurdsson has a lot more room for improvement, and after his recent impressive displays, I think it’s likely that we will see him perform eve better than in both 2011/12 and 2012/13 during next season.